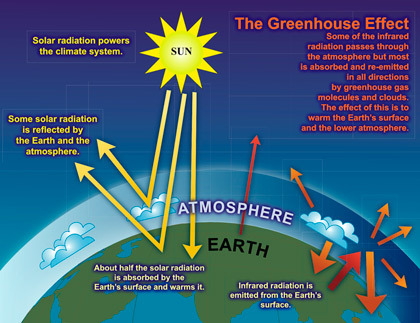 Because fossil fuels such as oil, gas and coal are burned to generate energy, large amounts of the greenhouse gas CO2 are emitted into the atmosphere. Moreover, the emissions of the greenhouse gases methane and nitrous oxide increased in the last decades because of intensive agriculture. All these gases allow solar radiation to get through the atmosphere to the earth’s surface, but prevent the radiation from returning. This is why the earth is warming up. Because the amount of greenhouse gases in the atmosphere continues to increase, the heat on earth is better retained, causing a rise in the average temperature. This increase in temperature has a great influence on the natural climate systems on earth. 1. It is very likely (more than 95 percent probability) that most of the warming over the last fifty years is attributable to human emitted greenhouse gases like carbon dioxide (CO2), methane and nitrous oxide. 2. Regional impacts of climate change are already being observed at present. It is estimated that these effects in most parts of the world may result, if the temperature continues to rise, in significant risks. Some regions of the world will have to deal with climate change with extreme precipitation, others with drought and desertification. The Dutch Meteorological Institute predicts that in the Horn of Africa weather will significantly roughen by more extreme rainfall and more extreme droughts. For large parts of southern Africa all models predict an increase in drought. Also, an entire Arctic melting is thought possible. Partly because of this, the IPCC predicts a sea level rise in the 21st century from 45 to 82 centimeters. Climate change also impacts global food security because it affects the fertility of agricultural areas. The FAO (Food and Agriculture Organization of the United Nations) has chosen the relationships between climate and food security in developing countries as one of its priorities.